it's been busy around our house and i'm feeling a bit overwhelmed. the home sold, nothing is packed, we move in a month, i have an art show i'm preparing for and jon and i will be out of town for a few days for a wedding. oh, and did i mention we don't have a home to move into yet? but enough complaining. this is my positive space and i wanted to share this picture i snapped today. 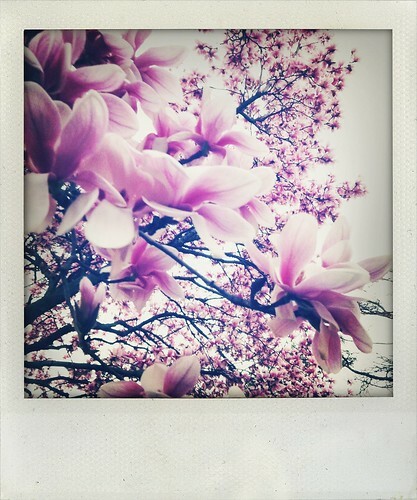 my parent's have the most amazing magnolia tree. it's branches stretch over the house and across the yard. the pink blossoms float in air against a bright blue backdrop. and in the distance you can smell the lake. fresh water walking across the street. and a sun setting over day. this was the perfect ending to my night. now i head off to bed and wake to spend a long weekend just the two of us in the big city. Sounds the perfect weekend to me. thank you! hope your move goes well too ;) good luck!! Sounds like you have a lot on your plate pretty friend. Hang in there. As my Grandma would say, "This too shall pass". Before you know it you'll be settled into the perfect home. i am anxious to get there! but i'm trying to look at this as an adventure rather than a bump in the road. your grandmas speaks words of wisdom ;) i'll keep those words in the back of my head!